The Hibiscus as a room name is chosen for its adornment of our landscape. The Hibiscus is part of a genus of colourful flowering plants found across the diverse landscapes of Sub-Saharan Africa. Its showy flowers and varying hues adorn homes and communities and, in so doing, lives threads of beauty and colour in its wake. 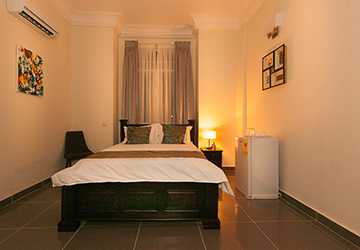 It invokes the vivacious beauty inherent both in the pristine and built spaces of Africa.